Energy companies in California used 70 million gallons of water for the hydraulic fracturing, or fracking, process to unearth oil and gas reserves, according to officials. The figure comes during the state’s increasingly urgent push to conserve water. That amount is of water used is less than previously projected by industry -- which estimated fracking used about 100 million gallons of water per year. Nevertheless, water in California is at premium. The state is entering its fourth year of record drought, and a mandatory water reduction plan was announced last week by Governor Jerry Brown. California may only have 12 months’ worth of water left, as snowpack measurements for the year are set to hit record lows. Yet fracking operations are not included in the conservation efforts. To unleash oil or natural gas from shale or other areas, the fracking process requires blasting large volumes of highly pressurized water, sand, and other chemicals into layers of rock. Once used, toxic fracking wastewater is then either stored in deep underground wells, disposed of in open pits for evaporation, sprayed into waste fields, or used over again. “Hydraulic fracturing uses a relatively small amount of water – the equivalent of 514 households annually,” Steven Bohlen, the state oil and gas supervisor, told Reuters, which first reported the water usage figure. Bohlen added that fracking uses more than fresh water, including “produced” water that surfaces during the fracking process that cannot be used for drinking or agricultural purposes. Patrick Sullivan, a spokesperson for the Center for Biological Diversity and Californians Against Fracking, said while the state’s fracking water use may only equal 514 households, much of that contaminated water can’t be used again, unlike most common household water usage. Reuters also reported last week that environmentalist groups have estimated that oil and gas developers in the state go through 2 million gallons of fresh water per day for oil production. Fracking has been linked to groundwater contamination, heightened earthquake activity, exacerbation of drought conditions, and a variety of health concerns for humans and the local environment. Oil and gas companies are under increasingly intense pressure nationwide to respond over increased transparency of chemicals used in the fracking process. As RT has reported, industry has avoided divulging -- often under the cover of official regulatory agencies -- just what chemicals are involved in their toxic injection fluids. Yet drillers insist the chemicals do not endanger human health, contradicting findings by scientists and environmentalists. “What [oil and gas producers] have been doing, especially in the [California’s agriculturally fertile] Central Valley, is injecting this very contaminated, very salty -- often containing benzene -- water into shallow aquifers and shallow water supplies,” Helen Slottje, of the Community Environmental Defense Council, told RT. In March, disclosures in California revealed that a bevy of toxic, cancer-linked chemicals in fracking wastewater are routinely injected back into the ground. In February, it was reported that California officials permitted oil and gas companies to dispose of waste and other fluids into aquifers containing drinking and irrigation water more than 2,500 times. Significantly, 46 percent of these permits were authorized within the last four years – the same timeframe during which the EPA warned California that regulators were not sufficiently protecting underground water reserves in the drought-stricken state. In October 2014, the state found that the oil and gas industry had illegally injected about three billion gallons of fracking wastewater into central California drinking water and farm irrigation aquifers. The executive order signed by Gov. Brown mandates cities and towns to reduce water usage by 25 percent over the next nine months to save approximately 1.5 million acre-feet of water “or nearly as much as is currently in Lake Oroville,” the statement said. The order also allows California to replace 50 million square feet of lawns throughout the state with drought tolerant landscaping in partnership with local governments; direct the creation of a temporary, statewide consumer rebate program to replace old appliances with more water and energy efficient models; require campuses, golf courses, cemeteries and other large landscapes to make significant cuts in water use; and prohibit new homes and developments from irrigating with potable water unless water-efficient drip irrigation systems are used, and ban watering of ornamental grass on public street medians. Alas, fracking operations are exempt from the reduction plan. “Governor Brown is forcing ordinary Californians to shoulder the burden of the drought by cutting their personal water use while giving the oil industry a continuing license to break the law and poison our water,” Zack Malitz, of the environmental activism group Credo, told Reuters last week. 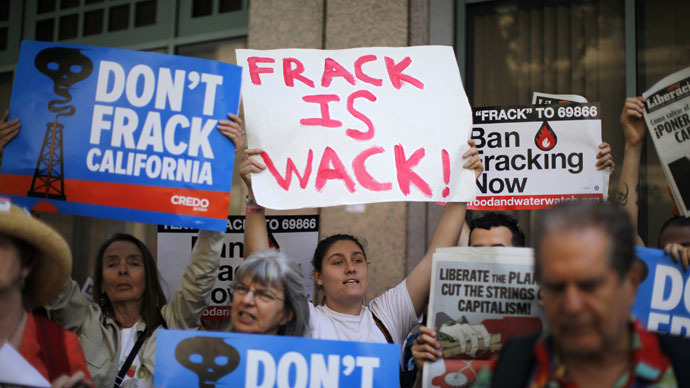 “Fracking and toxic injection wells may not be the largest uses of water in California, but they are undoubtedly some of the stupidest,” he added.